Doing more with less is the name of the game for SMBs. Learn about DocuSign’s suite of solutions for small business that let you deliver contracts, get approvals, sign invoices all without an IT department. 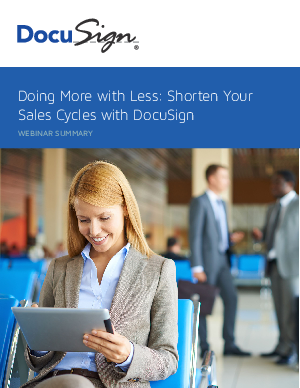 DocuSign seamlessly integrates with Salesforce and is easy to use for you and your team. Speed up sales, hire employees faster, and give your customers another reason to rave. Come hear directly from DocuSign product leads and customers about how you can make DocuSign for Salesforce go to work for you.